Healthful meals don't have to be expensive or time consuming. 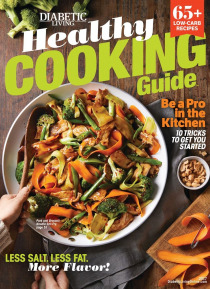 The quick recipe solutions in this title from the editors of Diabetic Living showcase healthful, dietitian-approved convenience products that can help you put nutritious and delicious meals on the table every time. Featuring more than 130 10-minute breakfasts, 15-minute lunches, and 20-minute dinners that have been time- and ingredient-… tested in the Better Homes & Gardens Test Kitchen. Every recipe is fast, satisfying, and - most importantly - is healthful, calorie-conscious, and carb-counted to help you manage your diabetes.